If you live in a small space, you understand the challenges involved. But you can make even the smallest apartment your own. The following 10 design tips will help you make the most of your small spaces – with maximum functionality and panache! 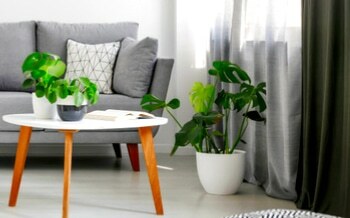 If you cannot paint the neutral walls in your apartment, paint your furniture instead. Painting furniture the same color is also an excellent way of disguising pieces that don’t exactly match. Placing metal utility shelving in the kitchen gives the space a sleek, industrial look. Add baskets to make storing pots and pans neater and easier to access. You can create a custom look in a small room by placing an area rug on the floor. In this case, a small room is an advantage, because an area rug will cover more space at a fraction of the cost of carpeting. 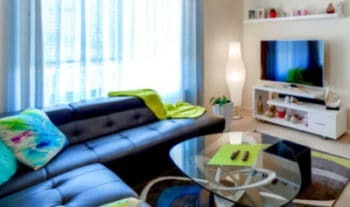 A large wall-mounted TV makes an excellent focal point for a room. Place a table or bookcase beneath it and add books or knickknacks to complete the look. Install a bookcase next to your entryway as a receptacle for umbrellas and other outdoor gear. By removing at least some shelves and installing hooks, the unit can also serve as a coat rack. Adding stylish drapes gives a room color and adds elegance. You can even hang curtains where there are no windows for added drama. Fold-out sofa beds are notoriously uncomfortable. A daybed or futon provides a much more restful option for your guests – and stylish seating during the day. Place a hamper by the door for wet umbrellas. Hampers placed by couches or chairs allow for a quick pick-up of the kids’ toys or other clutter when unexpected company arrives. 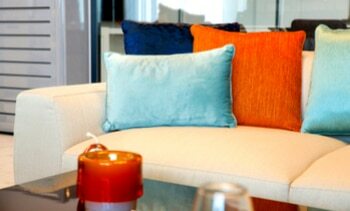 Add throw pillows to a couch or chair for an inexpensive burst of color. Large pillows make comfortable sitting spots in an informal living room or bedroom. Place chairs or couches at an angle in a corner of the room. The space behind the chair or couch then becomes a convenient, hidden storage space. To visualize your decorating ideas in our units and schedule a tour of Caprock Apartments!